I'm debating stepping up to this model from my current model X17z (mostly due to the abysmal CCC of said trailer). If I have to take another more expensive step and get beat up on the trade, I might as well forgo the canvas and step fully to 'the dark side'. This model has been out some time now; are there any problems with it or have most of the gremlins been found and swatted? I've read about slide alignment issues and something about the motor being undersized but supposedly addressed? The X213 is on our short list as well. We were interested in the X23B but after a summer in a pop-up we decided to ditch the canvas as well. The King size bed, and versatility of the bunks really appeals to us. We have grown kids, who occasionally will camp with us so having a couple of wide 300lb capacity bunks is great. Even better is being able to flip them up and use the area for something else when it just the two of us. 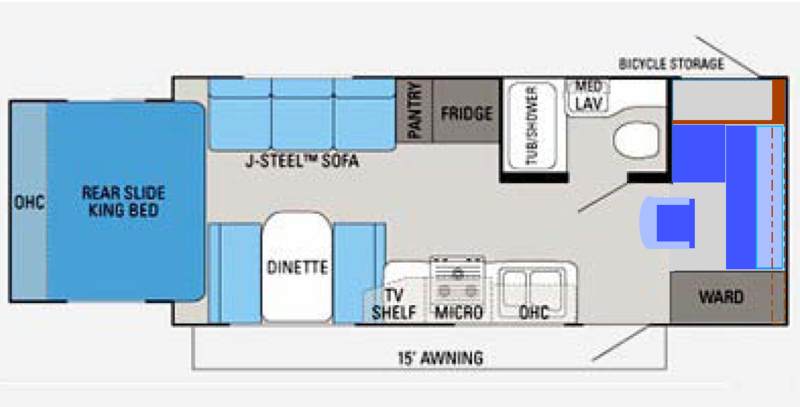 Another plus is having both the kitchen and dinette on the side with the awning so we can look out onto our site. The drawbacks I see with the x213 is that area with the couch and sofa is fairly cramped and not having a walk around bed (but willing to give this up to get a king bed). I read that just about every camper with a slide out of any kind can have problems. I guess the x213 is no exception, but I think the majority of them work well. We've looked a dozens of campers and keep coming back to a rear slide model. The Keystone Outback 210RS is very similar. It has a couple of things we liked better than the X213. 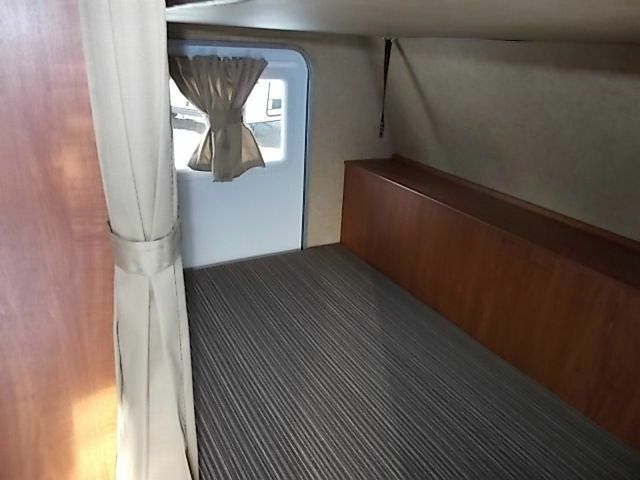 It has a small outside kitchen, which we would use. The cabinets in the slide are along the sides rather than in the very rear. So I think they would be easier to access. There is also a light in the rear slide, which the X213 does not have. I also think the exterior of the Outback looks cool compared to the Jayco. On the other hand, the 210RS is heavier (4920lbs vs 4258lbs yellow sticker unloaded weights) and sits higher up than the X213, so I think towing it would be more difficult. My wife also did not like the decor of the particular 210RS we looked at, but other interiors may be more appealing. You are not making an "impulse buy" so you will end up with a TT that is right for you. I'm a real fan of Jayco, and I have my reasons. IMO, blind loyalty to a product in not a good thing - side-by-side comparisons work well for the consumer. The majority of slides do work well - get the slide if you want it. The TT weights are not an issue, those are not heavy trailers. If your TV is capable for that weight, and you have a proper hitch setup, you won't know the difference. While dealing with weights, you might want to look into CCC. That becomes an issue for some buyers. A few inches of height does will not make a noticeable difference in towing. It's a good thing when using a waste tote, or getting underneath for whatever. The interior - can't help you with that one. Hope you enjoy your new TT. Bought our 2011 X213 new and we love it. We have had no problem with the slide. The only issue we've had so far was wih the AC unit. The first time we tried it in hot weather it didn't work. It was replaced under warranty. It's well made and an easy trailer to tow. We love the section in the front where the bottom bunk bed lifts up. We stick our bikes in this area while traveling and then it becomes a storage/staging area when were set up at camp. The X213 has worked well for us. Thank you all for the input - keep em coming !!! We also like what used to be the 23M; it looks like Jayco moved it to the White Hawk line as the 23MBH. Something about that floorplan really calls to me however its also another $2k North of the x213, which was $2.5k North of the X19H we were originally considering !!! We was really interested in 2009/2010 time frame going to hard sides from our OFF-ROAD POPUP series. Looked at several different trailers back then and really liked the X213. Since our kids are all grown up now there is only the two of us and our truck being the F150 line kept us in the 24-foot and less models to look at. We also could mount a modified put together wood desk and hutch arrangement with a side table to house all of our office computer, ham radio controls, and even a nice spot for a good printer setup. My computer setup is the DELL M90 17-inch laptop which has the DELL DOCKING Station setup and you could just simply bring in the laptop and insert it into the docking station and have external dual monitors, external keyboard and speakers etc al setup on the side desk. The front of the desk with the hutch would house all of the radio equipment.... A office desk roll around chair would fit under the main part of the desk allowing a draw curtain type door to close off the area. 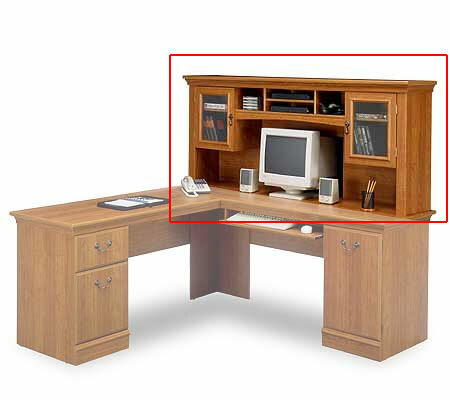 The BUSH series desk/hutch combo like this would have fit the area just fine with the side desk cut to to fit. Most of the deficiencies seemed to be in the 2009 and back models of the X213. The sagging of the slide out would rip the cushions on the sofa and table seat. The slide motor was also a weak unit for those models. I liked the change with the side windows verses the rear window that came with the 2010 model. The X213 was well within the F150 towing capabilities... Plenty of room on the roof area of the 213 for solar panels. Would have made us a great camping off the power grid mid size trailer with hard walls. That definitely was my choice for the mid size trailer... Got lots of reviews from fellow campers that had them. For two people with the occasional grand kid coming along and all of our office/computer/radio room toys this trailer would be have perfect for us. In the end however we never bought one and are still running the back road trails with our present 2008 OFF-ROAD POPUP camper. This would be for a family of 4 so the bunkhouse is important to us. To be honest the King slide could have been a Queen for all we care. That's why we peaked at the 23MBH; the Murphy bed would be fine for us but its more coin to go up that far. Though I'm sure I'm getting something for it, I'm not sure its worth it over the already accomodating x213. Got some time to sort this out ... spring purchase. Probably have to order it too as I'm pretty sure I want the 2" lift kit. We purchased our 2010 213 new and really enjoy it. We did have the slide motor on ours replaced under warranty in 2012 and have had no further issues with the slide. We do find the unit a bit low, and find that we can't empty into a tote unless the trailer is up on high blocks. I've also dragged the rear in a couple of spots (Going on/off ferry). I think you will find the top bunk a little tight for an adult. Our bottom bunk collapsed the first time an adult got in it, I added more supports to the ledge that it rests on. I have also added L.E.D. lighting, replaced the stabilizers with B.A.L. jacks and installed a group 31 battery. My 1/2 ton GMC (tow pckg & 4:10 rear end) tows the unit with no problem. I do find that its very easy to exceed GWVR with the trailer hooked up, so we're planning to upgrade to a 2500 this spring. We bought a new x213 in Feb 2012, we have used it numerous time in the past two summers and the only issue that I had was the power jack. It was replaced under warranty, we absolutely love this trailer and it is great unit to tow with my 1/2 ton Dodge Ram 1500. The only mods that I have made is changing my interior lighting to LED. I do the winterization myself and it is really simple to do.